"Let the one among you who is without sin be the first to throw a stone at her." Jesus did not deny the Scribes and Pharisees the right to carry out this prescription of the Law, but he insisted on one condition, namely, that they have no sin on their consciences. When Jesus and the woman were left alone, he looked up and said, "Woman, where are they?" Ironically, the self-righteous observers of the Law, so eager to throw stones, could not measure up to the requirement that Jesus had laid down. The feast of St. John the Baptist de la Salle, which is ordinarily celebrated today, is superseded by the Sunday liturgy. The first reading is taken from the Book of the Prophet Isaiah, 43:16-21. Last week we heard of the conclusion of the exodus from Egypt; the first Passover celebration in the land of Canaan. This week we look forward to a new exodus that God promises through the prophet Isaiah. The new exodus promises to be far more wonderful than the first. God promises to restore His people after they have suffered in exile. The second reading is from the Letter of St. Paul to the Philippians, 3:8-14, and is a warning to the Philippians about false teachers; Judaizers who would try to hang on to the old ways while at the same time claiming to be Christians. The Judaizers taught that in order to be a Christian, you first had to be a Jew: to be circumcised and to obey all 613 Old Covenant commandments. This question, whether or not Gentile converts to Christianity must first become full and legal Jews, prompted the Council of Jerusalem. 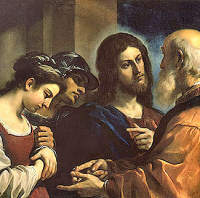 The Gospel is from St. John, 8:1-11 and is about the woman caught in adultery. "The two of them were left on their own, the wretched woman and Mercy. But the Lord, having smitten them with the dart of injustice, does not even deign to watch them go but turns his gaze away from them and once more writes on the ground with his finger. But when the woman was left alone and they had all gone, he lifted up his eyes to the woman. We have already heard the voice of justice; let us now hear the voice of gentleness. I think that woman was the more terrified when she heard the Lord say, 'Let him who is without sin among you be the first to throw a stone at her,' . . . fearing now that she would be punished by him, in whom no sin could be found. But he, who had driven away her adversaries with the tongue of justice, now looking at her with the eyes of gentleness, asks her, 'Has no one condemned you?' She replies, 'No one, Lord.' And he says, 'Neither do I condemn you; I who perhaps you feared would punish you, because in me you have found no sin.' Lord, can it be that you favour sinners? Assuredly not. See what follows: 'Go and sin no more.' Therefore, the Lord also condemned sin, but not the woman' (St Augustine, In Ioann. Evang., 33, 5-6). In the Extraordinary Form, this would be Passion Sunday. All Station Churches for Sundays in Lent were held at basilicas of Rome, but the major basilicas particularly for the first, fifth and sixth Sundays of Lent. The original church was erected on the site of the Roman Circus built by the Emperor Caligula around the year A.D. 40. and where St. Peter was crucified and placed upside down at his request and later buried here. From the PNAC: "Rightly has Pope Benedict XVI spoken of this basilica as the heart of the Roman Church, as St. John Lateran is the head. It is here that the Church honors her first shepherd in this city, and here that since his martyrdom she has celebrated both his witness and the God he served. While the basilica before us is relatively modern as far as the history of Christianity goes, being completed only in 1626, Christians have been coming to this site to ask for his intercession since shortly after the death of the Prince of the Apostles, as messages left by them on the wall of his grave attest." Aware how much He will endure from an unholy nation on the hill of Calvary (Introit), Jesus appeals to His Eternal Father, recalling how "they have fought against me from my youth" (Gradual). Yet for them, for us, He will shed His Precious Blood to "cleanse (our) conscience from dead works to serve the living God" (Epistle).